A highly decorated Generalmajor in the Wehrmacht during World War II. 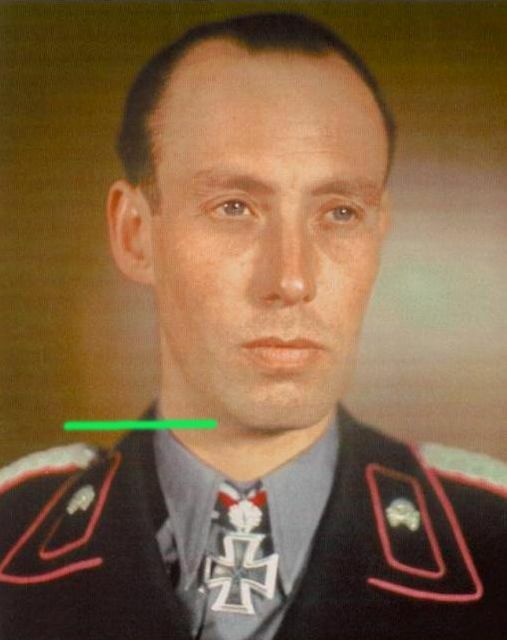 He was also a recipient of the Knight’s Cross of the Iron Cross with Oak Leaves. The Knight’s Cross of the Iron Cross and its higher grade Oak Leaves was awarded to recognise extreme battlefield bravery or successful military leadership. Von Lauchert entered on active duty as a Fahnenjunker (Officer Cadet) on 1 April 1924. By the eve of World War II, he had advanced to the rank of Hauptmann (Captain) and commanded the 2nd Company of Panzer Regiment 35. The first day of fighting in Poland brought his elevation to battalion commander after the previous commander, Hauptmann Stenglein, received a serious head wound – a common injury for armour commanders. Lauchert served with Panzer Regiment 35 of the 4th Panzer Division throughout the Polish and French Campaigns. During the first drive into Russia in the summer of 1941, he earned the Knight’s Cross to the Iron Cross. Lauchert’s skill and energy as a Panzer leader caught the attention of such armour notables as Heinz Guderian and Heinrich Eberbach. When Germany developed a new tank to regain its lost superiority on the battlefield, Major Lauchert was chosen to form and train the first two battalions of Panthers. Hitler ordered the delay of the 1943 summer offensive until Lauchert’s Panthers arrived to spearhead the southern arm of the attack. Unfortunately, the failure of the commanders whom Lauchert was supporting to familiarize themselves with this new weapon caused the Panther’s debut at the Battle of Kursk to be less than decisive. Lauchert continued to command a battle group of Panthers after Kursk, was promoted to Oberstleutnant (Lieutenant Colonel) and eventually was named as the commander of Panzer Regiment 15 of the 11th Panzer Division. While with this unit, he earned the Oak Leaves to his Knight’s Cross. In the summer of 1944, Lauchert was called upon to command Panzer Brigade 101, one of several new armoured units hastily formed to restore the German Army’s precarious situation in the East. As part of Panzerverband von Strachwitz and later as its commander, Lauchert helped restore the land connection between Army Groups North and Centre. Just one day before the start of the Battle of the Bulge, Oberst (Colonel) Lauchert was tasked with taking charge of the 2nd Panzer Division. His division punched through the American lines on 16 December 1944 and by the time the offensive had literally run out of fuel Lauchert’s men had achieved the deepest penetration into Allied-held territory of any of the German formations. Afterwards, Lauchert’s division fought a continuous rearguard action against the US forces as they pushed him back across the German frontier. During the fighting in February and March 1945, the 2nd Panzer Division had ceased to exist as much more than a marker on the map. By the end of March, as the remnants of his division were backed up against the Rhine without a secure crossing point, Generalmajor Lauchert ordered a breakout eastwards in small groups. Lauchert swam the Rhine with a small number of his staff and, apparently fed up with the hopelessness of the situation, quit the war and walked home to Bamberg, the home garrison of Panzer Regiment 35. After the war, he was imprisoned for trial at Nuremberg for war crimes, but was found not guilty and released. He was technical advisor on the 1965 movie Battle of the Bulge and is featured in the “Making of the Battle of the Bulge” featurette produced in 1965. This entry was posted in Biography, Germany by MSW. Bookmark the permalink.